This disc is a modern classic. When first released on the Teldec label a few years ago, Harnoncourt's New World was widely acclaimed as the best to have appeared in years. Now in 2006 it has been re-branded as a Warner Classics release, and re-priced into the budget bracket (1). The rave reviews are still justified, and are now enhanced by the added recommendation of price. Harnoncourt eschews tradition for tradition’s sake in the symphony. He approaches the score afresh, and the result is a reading both idiomatic and illuminating. Harnoncourt coaxes sparkling detail from the interplay of strings and woodwinds and allows the lower brass to come through cleanly. Trombones punch out the melody at the end of the first movement and the timpani strokes are crisp. The second movement flows gently, with beautiful playing from the woodwinds gliding over a lush, glowing surface of strings. There is no wallowing or point-making in this rendition of the famous largo. The references to Beethoven and Smetana in the fleet scherzo do not call attention to themselves, and the finale is urgent and majestic. Taken as a whole, you have a refreshing and fully integrated performance, led sensitively from the podium and rendered with pin-point perfection by the Concertgebouw. There is absolutely no need to make any allowances for the orchestra's playing in this exciting live recording. The audience was clearly spellbound: it is completely inaudible. It is useful to have The Water Goblin as a coupling - Dvořák’s first great tone poem following, on disc as in life, hard upon the heels of his last symphony. Dvořák returned to his homeland from his American sojourn and left his urge to write symphonies behind. Back in Europe, he abandoned the traditional four movement structure that he and his friend Brahms had done so much to keep alive, and embraced instead the symphonic poem of the avant-garde, a form pioneered by Liszt. Delving into Bohemian folklore, Dvořák emerged with a clutch of gruesome tales which he painted in vivid orchestral colours as only Dvořák could. The Water Goblin, his first essay in the form, tells the story of a young peasant girl who is taken to wife by the evil, lake-dwelling goblin of the title. Held as a prisoner in her husband’s murky kingdom, she yearns to return to home to her mother. After much arguing and begging, the villain relents, but will only allow her to visit the upper world, and keeps their goblin child as a pledge of her return. You can guess what happens. She never returns to the lake, and the enraged goblin dashes their child to death on her mother’s doorstep. Dvořák does not follow the tale literally, but recreates the events in sounds, using leitmotifs for each character and twisting them in Wagnerian ways to illustrate moods and emotions, as well as the action. Warner thoughtfully provides not only a brief note on the piece in the booklet notes, but also the programme note from the first performance in Munich in 1898 and explanatory extracts from a letter Dvořák wrote to Viennese critic Robert Hirschfeld in 1896. This recording comes from Harnoncourt's complete studio recording of the set of symphonic poems and is again superb. The Concertgebouw is in fine form here too, and the playing and conducting are most evocative, with the goblin himself emerging, in sound, as dark and menacing. So, how to sum up? 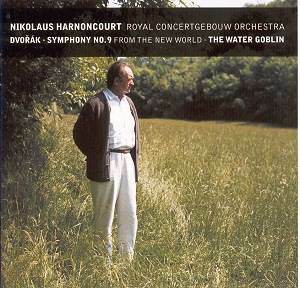 If you are looking for Dvořák's symphonic poems, chances are you will buy a recording of the cycle, and if you were to purchase Harnoncourt's complete set, this performance of The Water Goblin would suggest that you will be more that satisfied. On this disc, The Water Goblin is a delicious - if ultimately insidious - dessert. The symphony is the main course. The New World has been very well served on disc, with classic accounts from the likes of Kertész and Kubelik rubbing shoulders in the catalogue with newer entries. Only last year, two superb new recordings appeared – an exciting account from Charles Mackerras on Supraphon (SU 3848-2), easily eclipsing his earlier effort on Classics for Pleasure, and an immaculately polished and detailed performance from Paavo Järvi and the Cincinnati SO in phenomenal Telarc sound (CD-80616 - see review). Given this surfeit of excellence, no one would be foolhardy enough to proclaim any recording of the New World to be the best available. I will, however, go out on a limb and declare that this Harnoncourt recording is the best available recording in its price range. Kubelik's account is superb, but Harnoncourt has better sound. Mackerras and Järvi can match the sonics, but they are both at full price. For the budget-conscious, Harnoncourt is self-recommending. And for those who can afford the more expensive discs, why not spend a little extra and buy this budget account too (2)? Harnoncourt has something to tell even the most seasoned collector about this music, and in a warhorse like this, that is no mean feat! 1. Sadly, in Australia, this disc has been reissued at full price. Only those in the Old World, it seems, can have the New World at a reasonable price. 2. If you are a seasoned Dvořák collector and happy to forego the liner notes, you can download this album from Warner Classics' website for a meagre £3!